Shipping estimates for the iPhone X continue to improve, and in the United States, iPhone X models ordered today will arrive in just about a week. 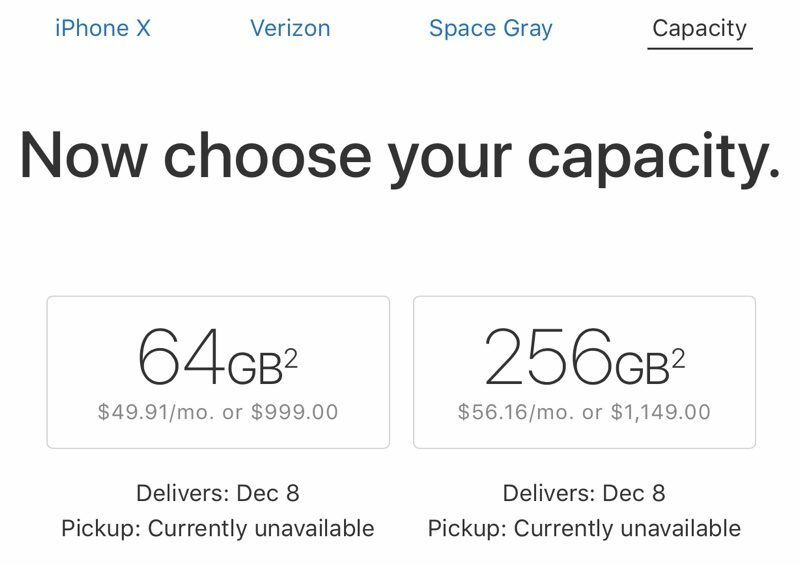 Apple's online store in the U.S. is currently listing a delivery date of December 8 for all new iPhone X orders, meaning iPhone X orders will need to ship out in just a matter of days to meet that estimate. The new under a week shipping estimates follow improved 1 to 2 week shipping estimates that were introduced on November 22.
iPhone X shipping estimates have also improved in Canada and multiple countries in Europe, while estimates are beginning to improve in Asia Pacific countries. The Canadian online store lists a shipping estimate of five business days, for example, while European stores list delivery dates of December 11. In Australia, New Zealand, and other countries, shipping estimates range from several days to two weeks. Over the course of the last month, Apple has been significantly ramping up production in order to meet demand for the iPhone X, and as a result, we've seen shipping estimates that have improved drastically since the iPhone X first launched. Following the October 27 pre-orders for the iPhone X, shipping estimates were as high as 5 to 6 weeks, but Apple has been able to improve supply earlier than expected. Initial rumors suggested the iPhone X would be heavily constrained and in short supply until well into the new year, but given the improvements we're seeing, Apple will likely reach supply/demand balance in the near future. In addition to improving stock for online orders, Apple has also been shipping out iPhone X pre-orders more quickly than expected. Customers who initially had December order dates have been receiving their devices throughout November, and Apple retail stores have also been receiving regular shipments. Back at the beginning of November, Apple CEO Tim Cook said Apple was working to ramp up iPhone X production week by week to get the new smartphone out to customers "as soon as possible." According to KGI Securities analyst Ming-Chi Kuo, the improved iPhone X shipping estimates are indeed due to better-than-expected improvements in production rather than a lack of demand for the new device. Remember a month ago when people were saying, “I have a feeling no one will be getting their iPhone X until 2018...”? Awesome. Now they can turn supply chain retooling to the X+. I like new phones and technology, but I can't justify paying $1500 CAD for a phone. Animojis and Face ID just aren't worth it to me. So clearly increasingly available due to lessened demand. I want one, but the cost benefit is just not there. The notch is irrelevant to me. But the phone is basically just another iPhone, which I love, but can’t justify the cost for this hardware. I am certain others feel like me. If it was cheaper, yep, I’d buy. If it was substantially a new experience, yep I’d buy. But it does not offer enough to draw me in this time. No home button? Why? That is a solution looking for a problem. Face ID... that’s weird, and another solution looking for a problem. Still, if it was cheaper, I’d do it. Just not worth it. Bummer. Underwhelmed when I played with it. No doubt, the masses feel the same as me. Great phone, but so is the one I have. But but but... Shouldn't Apple be withholding supply to stimulate demand? You know, like they did for the 6+, because it would have been a flop otherwise? So they can improve the delivery dates of the iPhone X after just one month, but it took them 6mo before the AirPods were readily available. Yeah, supply chain genius my ..... The demand simply isn't there. The Verizon and Sprint models full price ARE Unlocked. Just don’t activate it with a carrier. All the scalpers stopped buying or whoever has been getting them in order to make a quick buck.